Fuller's is dipping its toes back into the lager pond, with the launch of a new keg beer called Frontier. Described by head brewer John Keeling on Twitter as "a new wave lager", Frontier is already available in the Mawsons Arms next to the brewery in Chiswick. It is going into 50 pubs to test consumer reaction, he added. The Frontier launch is being supported by London-based marketing specialist Boutique Beer Brands which also represent the likes of Timmermanns and Blanche de Namur, presumably to help Fuller's reach out to a new market segment. 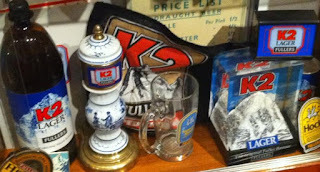 It's not the first time Fuller's has brewed a lager of course – in the early 1980s it produced one called K2. This didn't last all that long but you can still see K2 Lager memorabilia in the Hock Cellar at the brewery (left). And more recently some of its ales have been actively targeted at lager drinkers, most notably Discovery and Honey Dew – Discovery was subsequently switched from a normal cellar temperature ale to being served only chilled, at 8-10C. When the Fuller's Fine Ale club asked members last year whether the brewery should produce a lager, the responses were divided. Some said it would be an unnecessary distraction, others pointed out that British breweries – most notably Harviestoun, with Schiehallion – already made good cask or craft lagers, so why not? And of course since then we've been the continued rise of craft beer, including some very fine London lagers from the likes of Camden Town Brewery and Meantime, so it is not too surprising that Fuller's might decide to join in. Indeed, given its interest in historical beers for its Past Masters range and the fact that lagers have been brewed in London for well over a century (and elsewhere in Britain for even longer), perhaps a Past Masters-style dark Munich lager is in order. Being out of the country for a while longer, I won't be able to taste Frontier any time soon, but if you get the chance, please do let me know what you think! "Lagers have been brewed in London for very nearly a century" - totally wrong. Over 130 years, in fact. Indeed, the very first lager-only brewery in Britain opened in London, in Tottenham in 1881. Read all about it here..
K2 lager, incidentally, was withdrawn after the 1986 K2 disaster - not good PR to have a beer named after a mountain on which 13 people had just died.